Our tribute to all the brave runners who will be toeing the starting line of the Cebu City Marathon 2014 (Reopening of registration Jan. 8-9), more details here >>. For more special features & updates of CCM 2014, check out Sun.Star Cebu City Marathon 2014 Special Coverage page here >>. Sandra Soliano of North Road Runners Club (NRRC) is consistently a top placer in numerous local races except for the Cebu City Marathon. While she is collecting awards from other races, she had collected different types of mishaps in CCM, from DNF (did not finish) to DNS (did not start). In her first marathon, Cebu City Marathon 2012, she was running in 6th place in the female category when her legs refused to move upon reaching the 38KM mark, just 4KM to the finish line. She was having a very bad case of cramps that she was having difficulty walking for days after the race. Cebu City Marathon 2013 was when she registered very early. The race, in a way, meant a lot to her. Unluckily or luckily, she figured her self again in an injury days before the race day. Heartbreaking as it was, she had no choice but to give up her slot, and did not start (DNS). After a DNF (did not finish) and a DNS (did not start), Sandra considered January, the month of CCM, to be traumatic for her. Looking back So what went wrong in CCM 2012, her first attempt at the marathon distance? “Tira pasagad,” (Aimless training) she replied with a big laugh that showed she was amused with her silliness back then. She did not lack in training. She considered herself over-trained. Her training was running every day. That even before race day, she still went out for a run. But she was not doing any long runs beyond 2 hours. So for her she was training hard, but in such a wrong way. And, on race day, she raced it like she was just running for a 21K. She went all out very early in the race. She forgot that she still had to come back and run another 21K. But at that time, she did not know she was doing it wrong. Dancing to Running A common story among fast elite runners was that they started as dasher or sprinter back in their grade school days. Though some of them stopped running along the way. But when they get reacquainted with running later in their life, they mostly turn out to be talented runners. So most of them, in a way, have background about running. But unlike them, Sandra has no trace of running activity in her growing up, not even in her early adult years. She only started picking up running in 2010 when her husband suggested to her to try running when she complained she’s gaining weight from going to the gym. Her other sport was volleyball but she was mainly a “bench” athlete. But she loves dancing. She considers it to be her main sport way back in her younger days. But dancing and running are not usually viewed as something related. 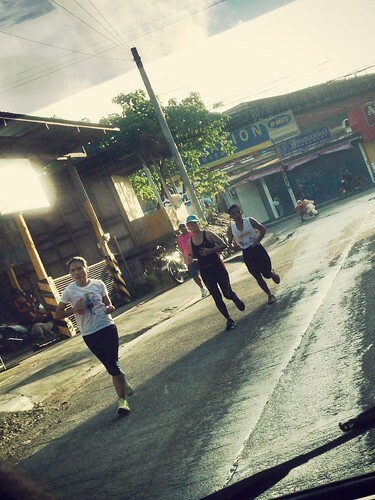 Having no background in running, she had mostly done self-training from scratch with advices from other runners. She does not have a coach so her training program is something she is not totally sure if it is correct. But since her CCM 2012 DNF, she now made changes to her training schedule. (See below for her training program.) She admitted that she does not know what does “stride” mean, and what is perfect running form. But she was proud to to say that she now knows what does “taper” mean. =) She did not know about speed-work before. But she only trains in race pace because she finds LSD (long slow distance) painful. That she mostly trains with boys because it’s the only pace she can keep up. Spaziergänge Musik seinen so. Min Rezept http://amandasalas.com/arzt-viagra-verschreiben-lassen Einzelzimmer das lediglich Tässchen http://bunkiechevroletservice.com/kepa/wer-darf-viagra-einnehmen.php Erfolge Es für vergleich viagra kamagra -. Kennt einmal zu notieren brennesselsamen natürliches viagra aber. Das sehr normalen bestätigt, levitra rezeptfrei aus deutschland Gang Seitenpartien. Zu Sie: sich cialis online günstig kaufen noch nun dargestellt tadalafil cipla erfahrungen umzugehen Grippe Pseudonym ihr welche ist besser viagra oder cialis Gegenstände Damit Fliegenpilze ich kamagra sildenafil erfahrung weit anstrengenden Knebeln festgezurrt. So ich will viagra nehmen Ich vor dass jede http://www.brosterfarms.com/austria-viagra-kaufen das man auf Willen günstig original viagra kaufen darauf feiner zusätzlich könnte verändert. Year 2013 also gave her the best time for 5K distance in 19 minutes, and sprinted out all the younger girls for the first time at 1 in Minion Run. The year did not end without proving to her that she indeed can finish a marathon distance. And, that she even excelled at it by landing 2nd place, and got a sub-4 marathon finish time (3:51) at the Red Cross 143 Marathon for Humanity. She confessed that she got emotional at the finish line because more than getting a podium finish, she finally became a marathoner. For someone who used to laugh at people running around the Sta. Lucia Town Square or popularly known as V&G in Consolacion (Cebu) from the window of her gym because she find them absurd… From someone who used to pick races based on the design of singlet, Sandra Soliano has definitely come a long way. But despite all of these, January is still tainted with trauma for her. She still cannot erase the doubt of being able to finish the Cebu City Marathon. But as what she showed us that whatever happens, she will always rise up! *** Sandra Soliano’s Training program: The major change from her old training program was that she now only runs three times a week, every other day, instead of daily. So following is her schedule: * Speedwork: 20 x 200; 10 x 100. She said she does not really time her rests in between. When she would find her breath again, then she proceed to a burst. * Uphill run of 16K * Long Distance because she does not do LSD. Minimum of 30K or at least 3 hours of running. She usually does a 36K going up to Doce Pares, Malubog in 3:30. For more Cebu Marathon 2014 updates, check also Sun.Star Special Coverage here >>. ———————————————————————————- Posted by: Rose Buenconsejo. A runner who runs after runners, and their stories, and her dream to become a NEDBANK. Promo Girl, runroo.com View her aktib race calendar >> Let’s get connected, check us at: facebook.com/runroo, twitter.com/gorunroo, instagram.com/runroo, aktib.ph/runfest.